One of the most eye-catching. Grown also for cutting when it will last 14 days in water. Height: 23-30cm. 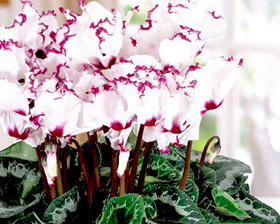 Sow cyclamen seeds from September to March in trays, pots, etc of good seed compost in a propagator or warm place to maintain an optimum temperature of 13-15C. Sowing Depth: 6mm. Germination can take 30 + days.